Bohrman Mfg. opened its doors in 1958 as Bohrman Mfg and Engineering. At that time, we were primarily a machine shop specializing in high volume machining for major OEM's. Over the years, the company expanded with growth into the stamping and steel service areas along with a growth into the automotive markets. This vertical integration led the company to the development of a number of custom machines dedicated to the manufacture of clips, clamps, straps, and brackets. Available in SAE and metric sizes, Bohrman Mfg. 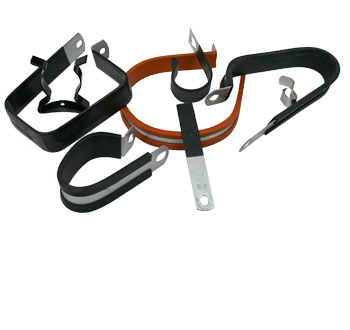 's standardized line of P-clips and brackets have become some of the most commonly used P-clips and line clamps in use today. Common applications include wire harness routing along with dozens of other wire, cable, tube, and hydraulic hose applications. Our standard clamp line is sold throughout the world to OEM. industrial, agricultural, marine, truck, and bus manufacturers. We also sell through fastener distributors and indirectly through logistics and inventory management companies.